A young Israeli father was murdered by PA terrorists in Samaria on Monday night. In the south, IDF forces halted a PA terrorist infiltration. Ido Zoldan, 29 and a father of two, was murdered in a terrorist shooting attack in Samaria around 11:00 pm Monday night. Palestinian Authority terrorists fired on the man as he drove past the village of Funduk, near Kedumim. Paramedics who arrived at the scene were unable to save his life. Zoldan, of Shavei Shomron, will be buried on Tuesday at 1:00 PM in Kedumim. He is survived by his wife Tehila and his two small children, three-year-old Aharon and one-year-old Rachel. The family moved to Shavei Shomron after they were displaced from Homesh in the Disengagement of 2005. A terrorist cell was waiting in ambush in the area for Israeli vehicles. According to initial information, a terrorist cell was waiting in ambush in the area for Israeli vehicles. When Ido, who was riding alone, came into range, the enemy attackers sprayed the vehicle with gunfire. The driver was critically injured, with multiple gunshot wounds, and he apparently died within minutes. Soldiers summoned to the scene closed off nearby roads and began searching for the attackers. The Fatah's Al-Aqsa Martyrs Brigades said it carried out the attack to demonstrate its opposition to the planned Annapolis conference. IDF officials have warned that terrorists will increase their efforts to harm Israelis during the days leading up to the meeting. The conference will be held at some point in the next 30 days, which, according to recent reports, could mean as early as next week. After his expulsion from Homesh, Ido Zoldan became one of the core leaders of the Homesh First movement, which seeks to reestablish a Jewish presence in the Samaria town. The terror victim's father, Nachman Zoldan, is among the leading building contractors in Judea and Samaria. Ido had joined his father in the Kedumim 3000 Company, which has been responsible for construction projects throughout Judea, Samaria and Gaza. According to a relative of the family, Amatzia Haeitan, the Zoldan family "builds for the sake of ideology and in order to build up the Land of Israel." Haeitan said that the younger Zoldan had introduced the idea of seeking out Jewish labor for work on the company's construction sites. "He lived this land and the people of Israel," Haeitan added, "and he was always happy." A friend of the family, Gadi, said Ido was among the "guideposts" of Homesh and of the Homesh renewal movement. "A daring Golani officer," said Gadi, "he was an unfailing Land of Israel loyalist. A man of Hebrew labor with his own 10 fingers. He was ready for any tiring or dangerous assignment at any moment, with no question and with no personal calculations; a smiling, generous friend, who spoke little and did much." At around the same hour as the fatal shooting attack, in the south of the country IDF forces prevented an apparent attempt by PA terrorists to infiltrate Netiv Ha'asarah, a Jewish communal village adjacent to Gaza. At approximately 11:30 pm Monday night, soldiers spotted three armed terrorists making their way towards the separation barrier between Netiv Ha'asarah and northern Gaza. IDF forces opened fire at the PA terrorists and a gun battle ensued. Two of the terrorists were killed and a third injured. No soldiers were injured in the incident. IDF sources say that the three-man enemy cell was planning to scale the wall and carry out an attack against a Jewish target. 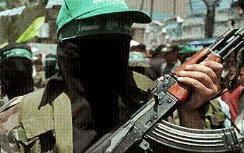 The terrorists, carrying guns and grenades, were intercepted before managing to cross the Gaza perimeter. In a subsequent incident overnight, IDF soldiers spotted an armed enemy cell along the perimeter fence in southern Gaza. Troops opened fire on the cell, killing two of them.